Fantasy | What a book! The Wheel of Time series is back and has shaken off the sloggy funk it was in from Winter’s Heart clear through to Knife of Dreams. Gone are many of the entire physical descriptions (hips and bosoms for women, mustachios for men) and life histories of characters whose only role was to utter one line and then exit the story. Now there are battles and skirmishes and political machinations and plots that actually seem to advance the story. And the Last Battle is no longer the talked-about thing it’s been for the past 13 books, it is here. Some people I know liked The Gathering Storm, the last book, more than this one, but, while I enjoyed Gathering Storm, I enjoyed this one much better. I found myself anxiously waiting to either go to work or leave for home at the end of the day so I could hear what happened next (obviously, I had the audio version). As promised by the supernatural effect of ta’veren Rand,, Mat and Perrin, all the storylines and characters are coming together, so this penultimate book in the epic series is a satisfying setup to the finale, A Memory of Light, which, I have read, is due out next year. Michael Kramer and Kate Reading once again read the audio version, switching off based on the character being followed by the narrative. Each gives an excellent, un-self-conscious performance (and let’s be honest, nerds, reading fantasy out loud can easily make you feel self-conscious) and I marvel at how they have managed to, over 13 books, keep true to the accents of the different nationalities, races and creatures they introduced in the first book. If you dropped the series for the same reasons I was thinking of dropping it, force yourself through the sloggy bits so you can get to the end. You’ll be glad you did. Boy, this book took me forever to read, although it is not necessarily the fault of the book. Just had other things to do. Interesting fantasy world K.J. 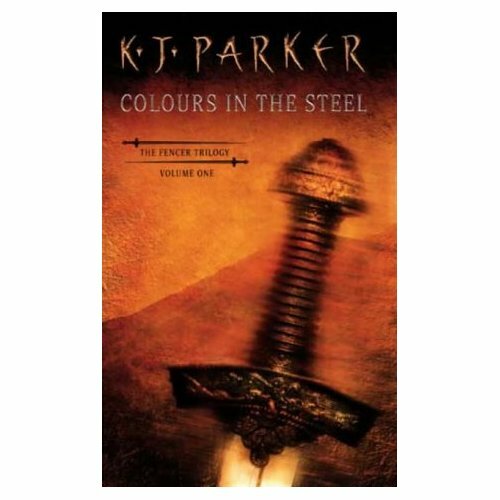 Parker has set up here in “Colours In The Steel,” book one of The Fencer Trilogy. An apparently impregnable, prosperous city, center of the empire. Matters of law are settled by fencers, who are lawyers, but they don’t fence with words, they literally fence, with the case decided by which lawyer (fencer) lives and which one dies. Magic in this world, like so many other things, are a bit of a fraud, although that it exists is understood fully by the ones thought to practice it. There is humor, but it is dark. And while there are some people you’d classify as “good,” they aren’t exactly saving the day. And while plenty of the people here do bad things, or have done bad things, they aren’t really “bad” people. Anyway, the characters here are interesting takes on the grizzled old soldier, the young assistant, the vengeful young warrior, etc. Some of the “magical” coincidences seemed a little to coincidental for my taste, but they still make sense in the logic the story presents. A rich fantasy world well-written, if a bit slow at times. If you like military fantasy or are into technical details, plenty of that here. The siege and battles in the book are quite well-detailed and the minutiae of siege engine construction and weapons forging are interesting and concise, although you won’t (thankfully) get descriptions of Tom Clancy-esque proportions. One big misstep though was there was no map. A fantasy book should always, always, always have a map, although there is very little traveling in this book, so maybe one was deemed unnecessary or if it’s just the edition I had. Yes, I have an imagination, and it was fun to build the city and surrounding lands in my mind, but I still like maps. Perhaps subsequent books in the trilogy have it. If you like sharp, intelligent, darkish fantasy with a minimum of magic, little people and fanciful characters, then you’d like this book.